Metra is the largest operator of the F40PH in the USA with the type working on most of its commuter routes out of Chicago. #115 is seen heading out of town at the CP Morgan crossing shortly after leaving from Chicago Union Station. Built from 1975 until 1992 the General Motors Electro-Motive Division F40PH was once the mainstay of long distance routes across the USA with Amtrak. While the type was withdrawn from Amtrak service in the 1990's the locomotives are still in use crossing Canada with Via Rail and can be found on many commuter railroads across the USA. 4914, one of the Metro-North F40PH fleet approaches Secausucs Junction in New Jersey with a train believed to be heading towards Port Jervis. NJT's own F40PH's are now confined to the history books having been replaced by more modern diesel and bi-modal locomotives from Alstom and Bombadier. However the locomotives have not disappeared from NJT metals entirely as a limited number are owned by Metro-North Railroad for their West of Hudson operations (sub-contracted to NJT). The small fleet of locomotives have recently been re-painted and look very smart. Most typically they can be found working trains on the Port Jervis line from Hoboken Terminal. A 'squashed' F40PHM at La Salle St waiting to work an off-peak service to Joilette. 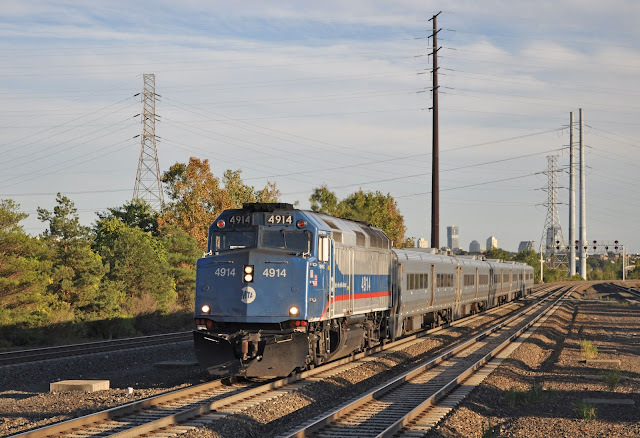 The majority of the Metra locomotive fleet is made up of F40PH-2 and the slightly less common looking F40PHM-2 locomotives which differ in appearance with a squashed front missing the characteristic 'nose'. 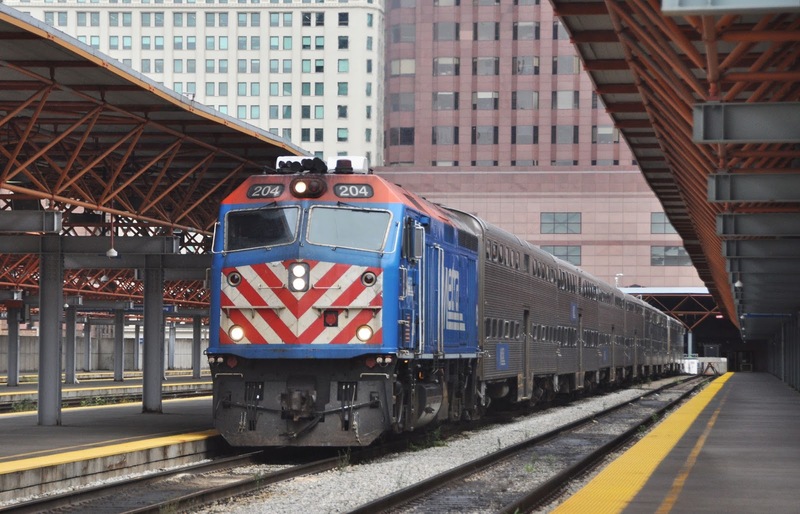 The locomotives can be found on all of Metra's diesel routes originating from Chicago Union, La Salle St and the Ogilvie Transit Centre. 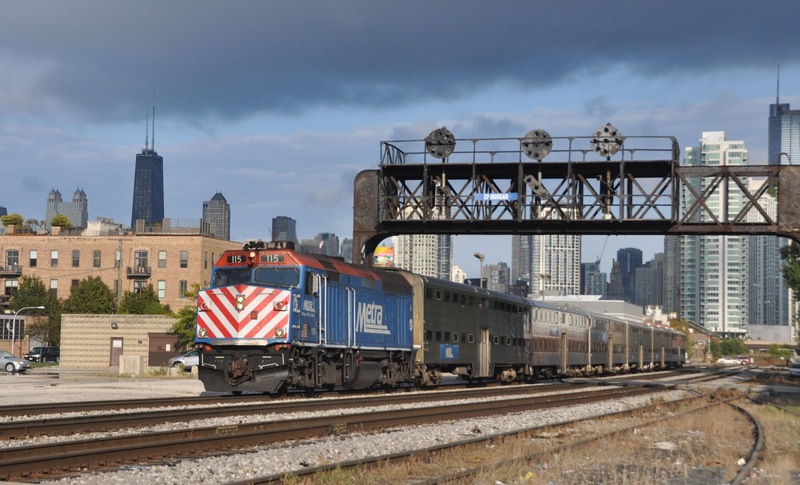 Metra operates a very intensive peak service and a large number of locomotives can be seen in a short space of time. Discounted day tickets are available at weekends when a less intensive service operates. All locomotives are currently in Metra's blue livery however over the next 4 years 42 of the fleet are to be overhauled and painted into the newer livery sported by the MP36PH and ex-GO Transit F59PH locos. A rather different operation to the commuter railroads of North America the Grand Canyon Railway operates up to two trains each way per day between Williams, AZ and the North Rim of the Grand Canyon. The majority of the railroads fleet is made up of ex-Amtrak F40PH's which provide reliable and efficient power for its tourist trains. NPCU 90229 is seen at the rear of a Pacific Surfliner as it skirts the beach at San Clemente, CA. Despite dispensing with the F40PH as motive power in the 1990's in favour or the GE Genesis series locos the class has retained a purpose with Amtrak. 22 locomotives were converted to Non-Powered Control Units (NPCU's) to enable push-pull working of Amtrak trains. These vehicles had their engines removed and large roller doors fitted to allow their former engine space to be used for luggage. 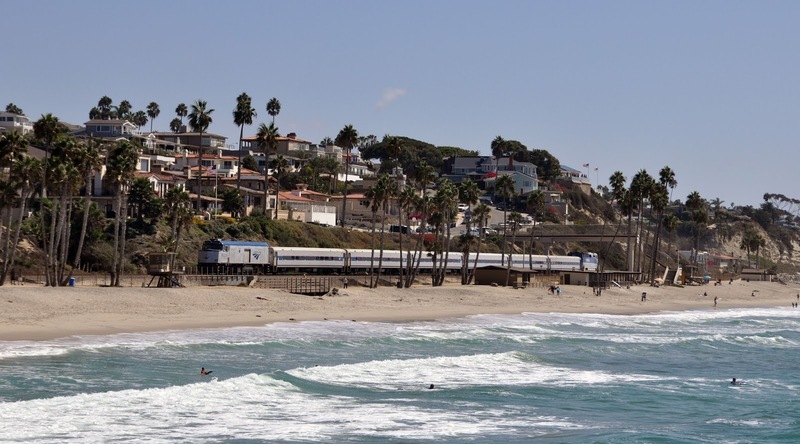 NPCU's can be seen on various Amtrak routes including the Hiawatha (Chicago to Milwaukee) and some Pacific Surfliner services in California. One of the most scenic sections of the Coaster route is at Del Mar where trains run high above the beach and Pacific ocean below. 2103 is seen heading northbound with a late afternoon service to Oceanside. 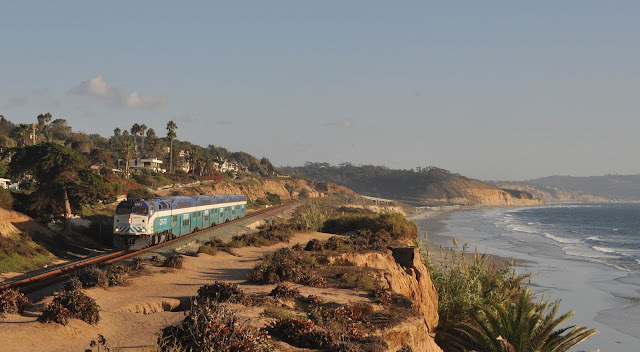 One of the most scenic routes one can travel behind the F40PH's is undoubtedly the 'Coaster' which runs much of its route along the Pacific shore from Oceanside to San Diego in California. F40PH's make up the mainstay of the fleet running with Bombadier Bi-Levels. Unusually 3102 and 3103 double head the final arrival of the morning into San Jose, seen here crossing the salt marshes at Alviso. 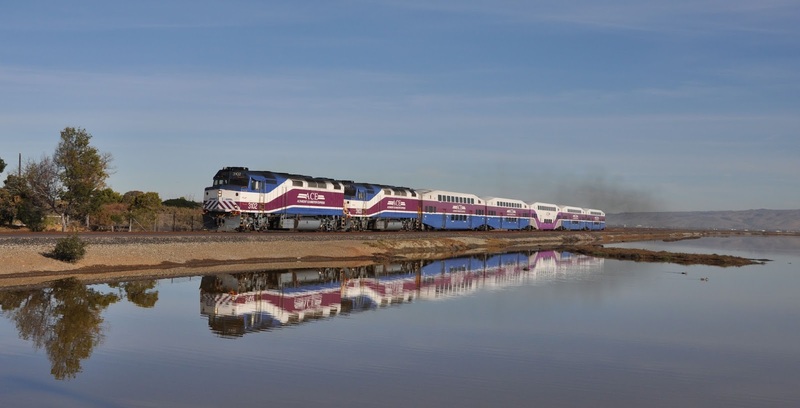 Typical of the North American commuter routes which offer only a limited service the ACE runs just 4 trains each weekday in each direction between Stockton and San Jose. The entire fleet is composed of F40PH locomotives which operate with Bombadier Bi-Level coaches. 911 approaches South San Francisco with an afternoon service to San Jose Diridon. 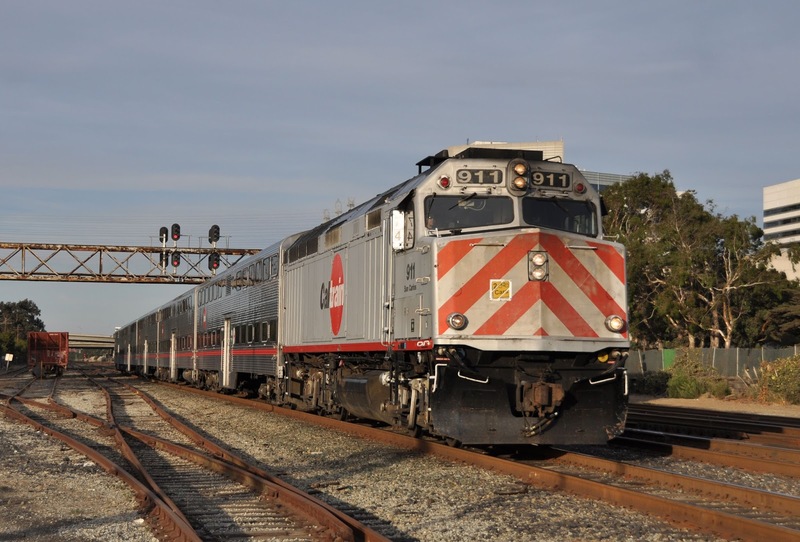 Another large operator of F40PH locomotives is CalTrain which runs the busy route from San Jose to San Francisco. Regular trains run throughout the day seven days a week and there are exciting plans to develop the line with funding secured for full electrification and new trains. F40PH locomotives work most trains along with MP36PH locomotives which additionally working limited stop 'Baby Bullet' services. In July 2016 contracts were signed for the modernisation of the line with Balfour Beatty providing electrification works and Stadler to provide new EMU's which will offer a step change in the service and likely the end of the F40PH's on this route.